Following the US-China climate deal, Lancaster University researcher Mike Berners-Lee outlines five more things the global community needs to do to tackle climate change. 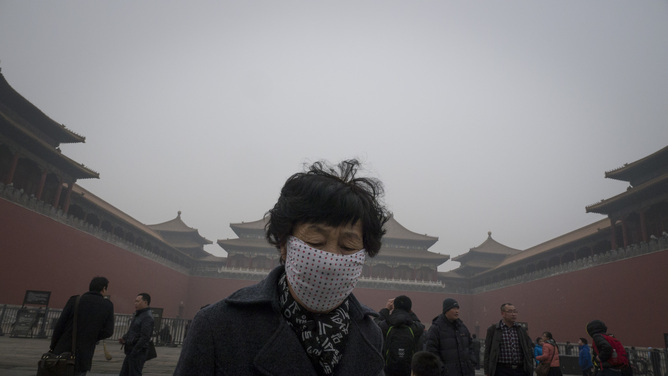 Some great news at last, as China and the US announce a secretly negotiated deal to reduce their carbon emissions. After years of seeming to get nowhere at all it looks like we have the beginnings of meaningful commitments. If the rest of the world can fall in line with the combined targets of China, the US and EU, and if between us all we can enforce them, we would actually have progress. Not success, but for the first time we would have better-than-nothing global progress on climate change. But just before we all relax, lets get things into perspective. Global emissions have been on a mathematically predictable exponential trajectory for at least 160 years. Cumulative CO2 emissions (broadly speaking that’s what determines the temperature change) continue to double every 39 years. Nothing that anyone has done to date has succeeded in making even the faintest detectable change in that. To be blunt, our species has so far not demonstrated any ability whatsoever to influence global emissions growth through deliberate action on climate change. Savings in one place have simply popped up elsewhere. And if we stay on our age-old trajectory we will shoot through the likely threshold of two degrees in the mid-2040s. But just before we all relax, lets get things into perspective. Global emissions have been on a mathematically predictable exponential trajectory for at least 160 years. Cumulative CO2 emissions continue to double every 39 years. Nothing that anyone has done to date has succeeded in making even the faintest detectable change in that. 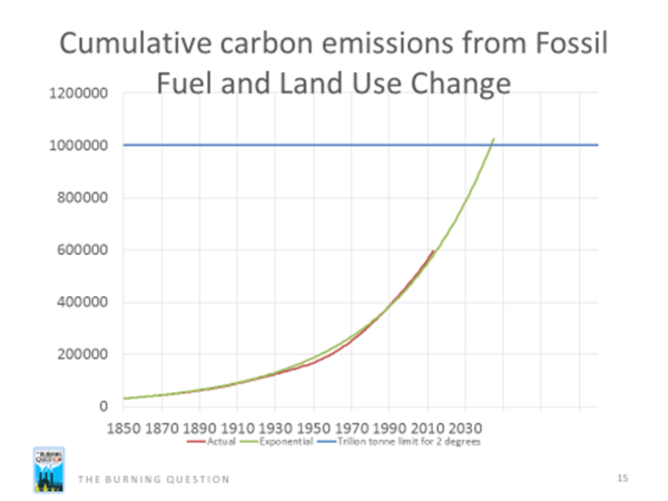 By that I mean that by about 2045 we will pass the point at which we will probably experience more than a 2°C rise even if no-one anywhere in the world ever again set fire to any coal, oil or gas. And, roughly speaking, 39 years after that we will crash through the 4°C threshold which humans would be very likely to find extremely unpleasant. Of course we don’t really know all that much about what level of temperature change will cause us what level of suffering and death. We don’t understand the climate discontinuities that we might trigger, and we don’t know how good we will be at adapting to change and we don’t know how good we will be at preserving world order if things get tough. The mainstream consensus is that 2°C entails significant risk of something nasty happening while 4°C is probably very nasty indeed. No one knows for sure. What we need is a global constraint on greenhouse gases. And it needs to be rapid enough to keep temperatures as close to 2°C rise as possible. This much, thankfully, seems to be uncontested these days among people who talk any sense on climate change. So how far do the latest US and China pledges take us? If (and it’s still a big “if”) the world falls quickly in line with the US (27 per cent cuts by 2025), China (peak by 2030 – by which time their emissions could be enormous) and EU (40 per cent cut by 2030) announcements we will come off the exponential curve but still fly through the 2℃ threshold and well beyond. Coming off the curve would be a huge achievement but not nearly enough. So when I say we might actually stand a chance of getting somewhere, I don’t mean that things are looking rosy. But I do mean this gives me real hope, as big players are talking the right language at last. All we need now is more of the same – and to make sure the words turn into enforced action. That will be enormously challenging but it is radically more hopeful position than the situation we have been in in which sticky plasters have been proposed, no amount of which could help. We need the rest of the world to come into the fold with similar commitments, so we get a leak-proof deal on leaving fuel in the ground. Any countries that don’t participate will probably end up growing their emissions to undo efforts made elsewhere, because that is how the system dynamics work to negate piecemeal actions. Binding targets need tightening up for everyone, beyond what is currently on the table, to take us a lot closer to topping out at 2°C. The deal needs enforcing. This is going to be tough, remember that the exponential global emissions curve has proved incredibly resilient to date. All the greenhouse gases need to be properly included in the plan. We need to head off a global dash for biofuels which will undoubtedly be at the expense of feeding the world’s poorest if left to market forces. Some smart and robust agreements are going to be needed on land use for biofuels. While all this is being put in place we can start investing in the technologies we will urgently need – redirecting the money we have been channelling into fossil fuel research and development. To sum up, the announcement is very encouraging. There may still be a long way to go yet and we all need to push hard for next year’s Paris talks to put it all in place – but it is starting to look as if it might actually be worth the effort. Mike Berners-Lee is the founding director of Small World Consulting which helps organisations understand and respond to the climate change agenda. This article was originally published on The Conversation.